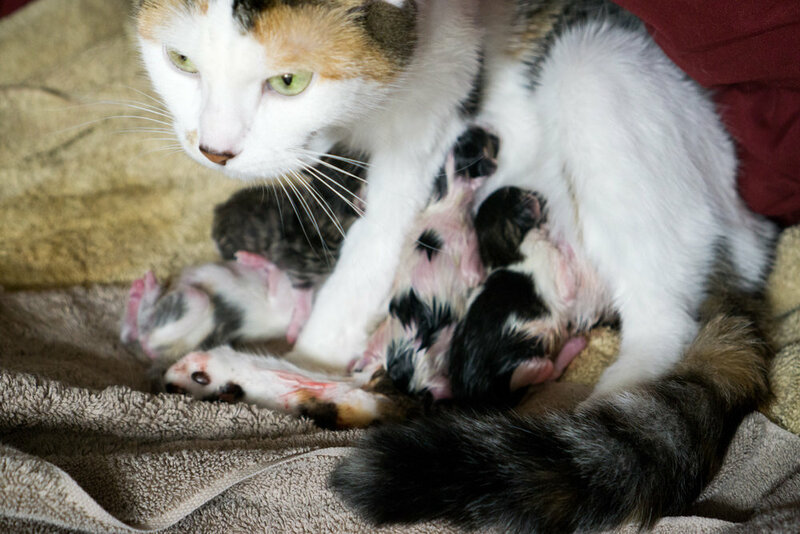 After a lot of patient waiting on the part of Kitten Academy faculty, staff, and fans, Angel gave birth to four beautiful and healthy kittens! The delivery started around 1:45 PM on Sunday, the 26th of February. 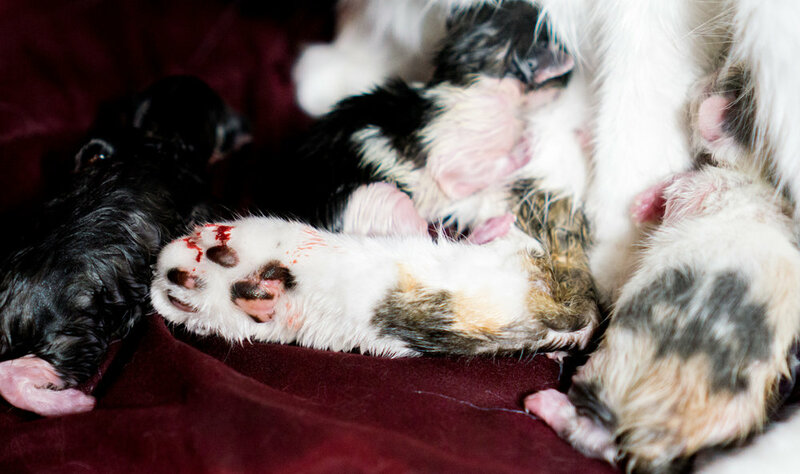 We expected some complications when her first kitten arrived paw-first but everything went smoothly. The kittens have been quick to nurse and even purr! They are doing exceedingly well and we have great hopes for them in the coming weeks at the Academy. We apologize for the quality of the following photos - Angel's a little bit of a nervous mom and we don't want to disturb her more than necessary in these first days. With no further ado, here are the kittens with their names! They are "Angel's Fish" and they are listed below in the order of their birth. Haddock - Female - "Haddie"
Halibut - Male - "Hal"
Pomfret - Female - "Pom"
In case you missed the live births or just want to review, here is a link to the archived footage of Angel giving birth. The video description contains clickable links to the time of each birth - the first one is about an hour and twenty minutes into the video. If you would like to see a quick video of the kittens up close on their first night at the Academy, click here. As usual, here's a collection of the rest of the photos. WARNING: A few of these from during the birth may be a little much for the squeamish viewer!